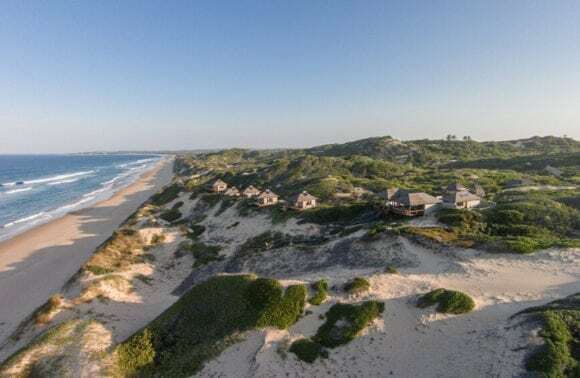 Rio Azul Lodge is situated on the Northern end of the Bazaruto Archipelago at the mouth of the pristine Govuro River which enters the sea at Bartholomew Dias. 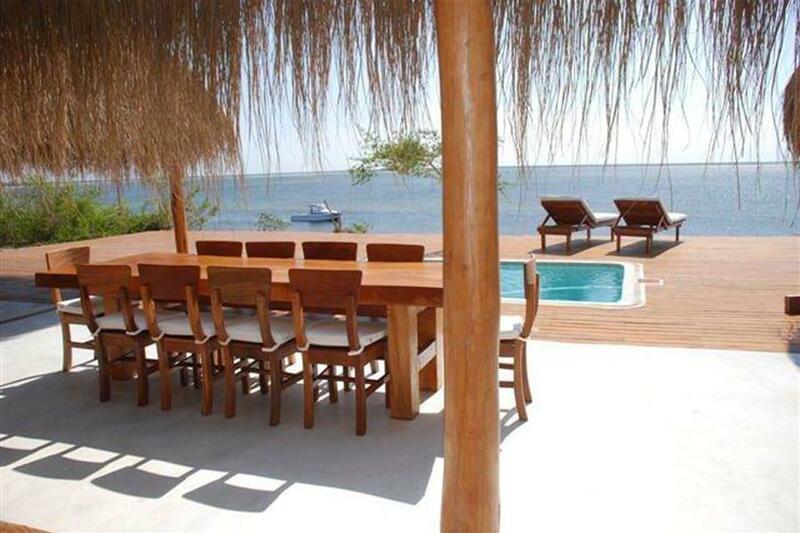 Guests enjoy a scenic 2 hour road transfer from Vilancoulos before reaching this private beach haven. 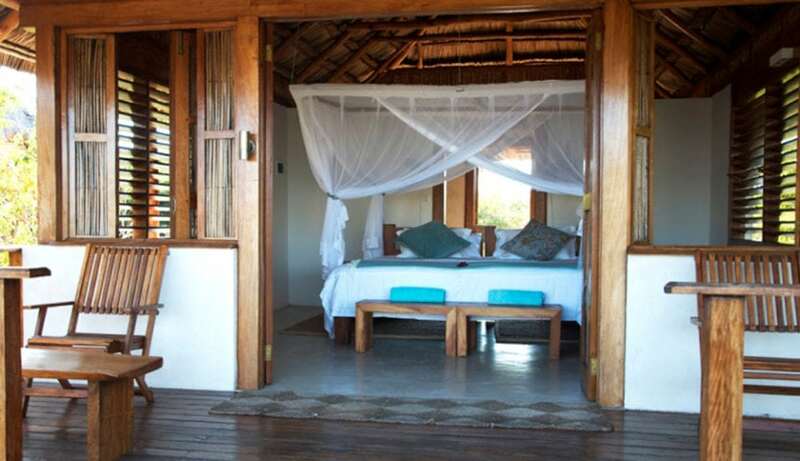 Accommodation consists of 6 twin thatched chalets with three quarter beds and en-suite bathrooms. 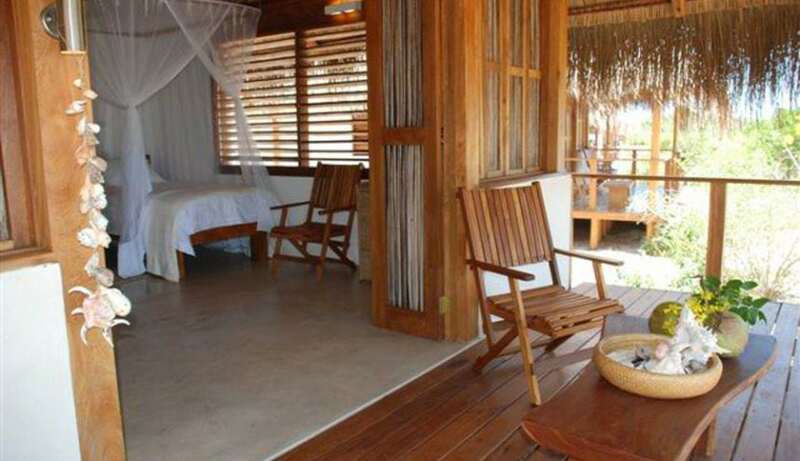 Each room has a wooden deck overlooking the estuary. Beds are equipped with mosquito nets. Each room has two hand wash basins with mirrors, a toilet and a shower with hot and cold water. Each room has its own boat for use in the estuary. 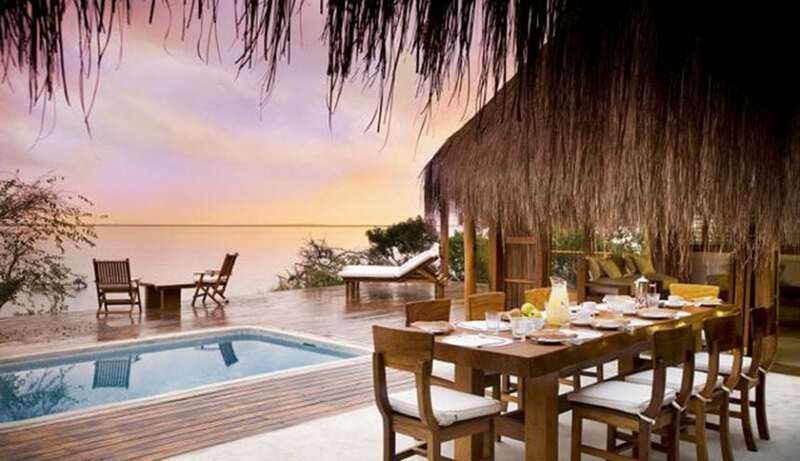 The main lodge area consists of a lounge, dining room and bar area with a big wooden deck in front and a plunge pool. There is a small shop that will sell items such as batteries, sun block, hats, lures, line and other fishing tackle. The lodge has electricity supplied by a generator and plug points for charging camera batteries etc. 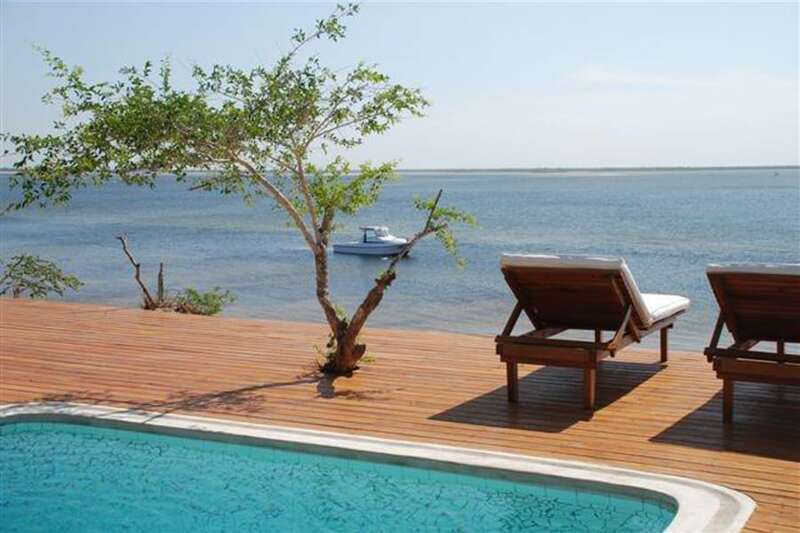 Rio Azul is located on the banks of the Govuro River in Mozambique, overlooking the estuary and is about 2km from the river mouth. The Govuro River runs north from Vilanculos and past Inhassoro and enters the sea at Bartholomew Diaz point. 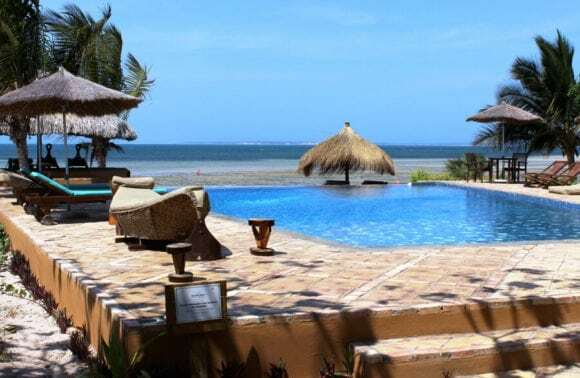 Rio Azul is one of the few venues along the Mozambique coast where one can access deep water with strong currents close to the beach. The point at the river mouth has deep water right at the edge and big game fish move into easy casting distance of the shore to feed. The estuary offers many species of fish for light tackle fishing. There is abundant birdlife in this mangrove region as well as beautiful, unspoilt beaches to be explored. There are daily flights to Vilanculos with LAM, and flights 5 days a week with Airlink. 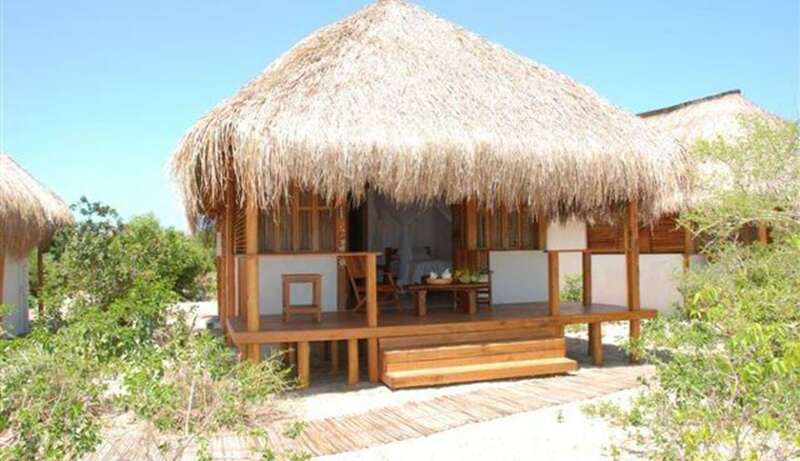 On arrival in Vilanculos you will be met & transferred by air-conditioned vehicle to Rio Azul. The resort is approx. 130 km north of Vilanculos and the road transfer takes approx. 2 hours. Mozambique is a Malaria area. 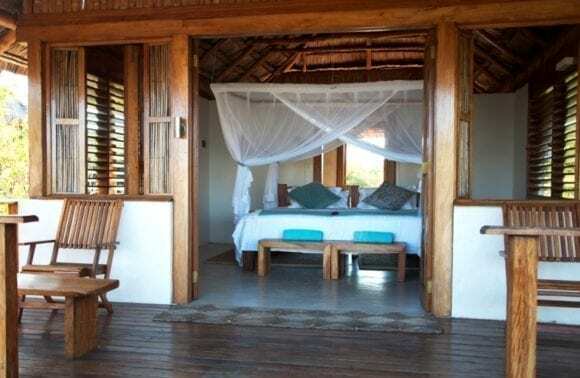 Rio Azul will make every effort to reduce the risk to guests by regularly spraying the lodge environs with mosquito poison and by supplying adequate mosquito nets. Guests should consult a physician with regards to precautionary medication before leaving home. Bring along your own supply of insect repellent. Situated on a pristine estuary which is a breeding site for the rare dugong. 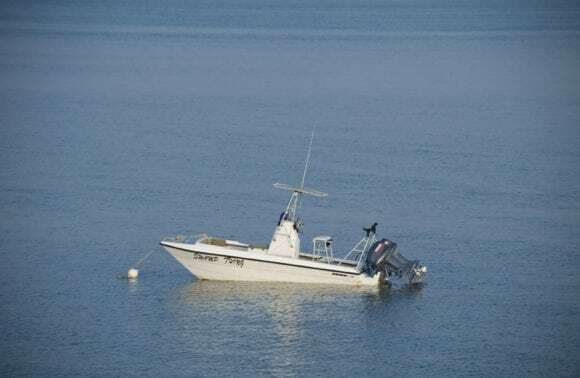 Both boat and shore fishing. This is a wonderful fishing venue from deep sea fishing to shore fishing, estuary fishing to salt water fly fishing. The area offers some great bird watching with specials such as mangrove kingfishers and crab plovers. Activities include beach walks, kayaking, sundowner cruise on a local Dhow, trips to BD Island and snorkeling. Excursions to Santa Carolina (Paradise Island) offer excellent snorkeling opportunities, and can be combined with picnic lunches. 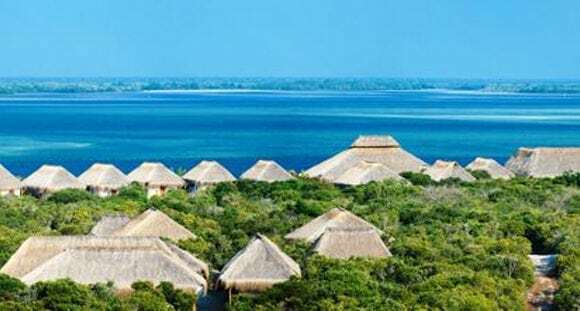 Rio Azul is located on the banks of the Govuro River in Mozambique, overlooking the estuary and is about 2km from the river mouth. The Govuro River mouth is 130km north of Vilanculos. The Govuro River runs north from Vilanculos and past Inhassoro and enters the sea at Bartholomew Diaz point. 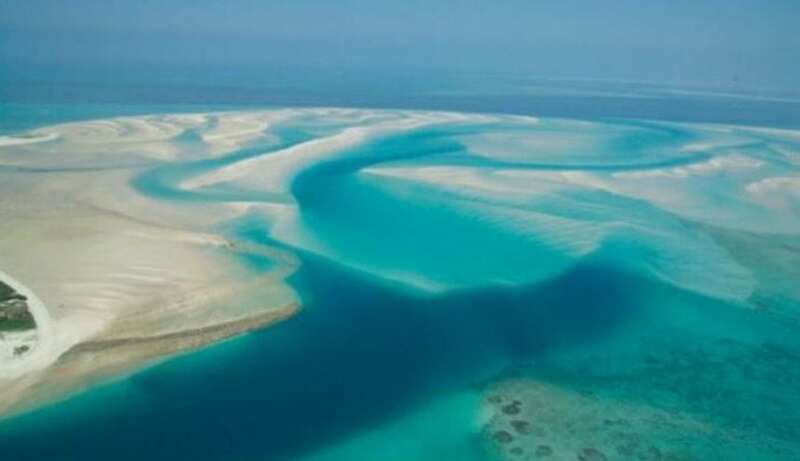 Rio Azul is one of the few venues along the Mozambique coast where one can access deep water with strong currents close to the beach. The point at the river mouth has deep water right at the edge and big game fish move into easy casting distance of the shore looking for food. 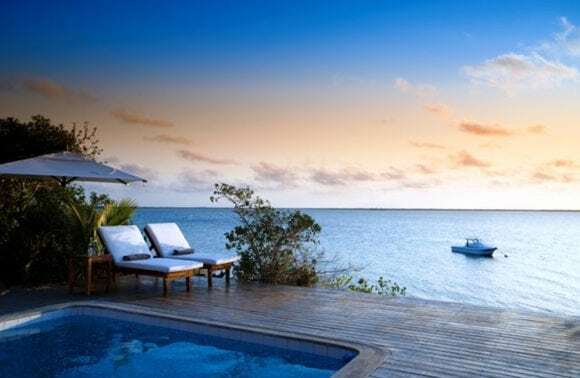 Rio Azul is unique in that it offers good quality estuary fishing, brilliant surf fishing and some of the finest offshore fishing in Mozambique. This venue is ideal for fishermen who enjoy a variety of fishing techniques from fly-fishing, to light tackle lure fishing, surf fishing and deep-sea fishing. The policy at Rio Azul is strictly catch and release. Bait will be available from the lodge at no extra charge to guests and will consist of: prawns, squid and fish. The lodge will endeavor to supply live bait whenever possible. The boats that each room is supplied with are ideal for estuary fishing. 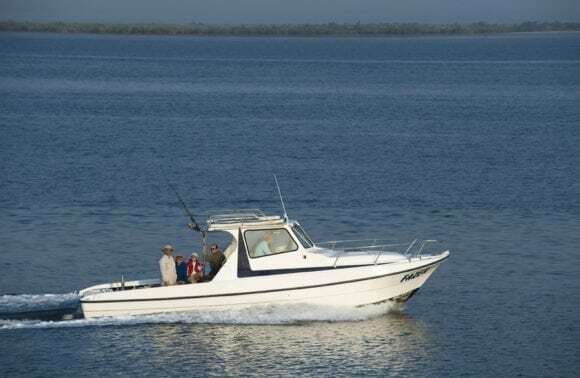 The boats are Ali boats, like the ones used in the Okavango delta, fitted with a single 15 horse power Yamaha outboard motor. Each boat has a fish finder GPS unit, an electric trolling motor, a two-way marine radio, a spotlight, a laminated map of the estuary with fishing hot spots marked on it, a cooler box and a fold up sun cover. Guests will be given a course on how to operate the boat as well as the electronic equipment on board when they arrive. Guests will have the choice of hiring a local skipper for their stay should they wish to. The estuary is extensive and offers diverse fishing from trolling lures, to casting baits, lures and flies. Fishing the deep main channels is good for grunter, stumpnose, kingfish, queenfish, barracuda, sharks, brindle bass and rock cod. The mangrove channels are excellent for fishing for river snapper, ox-eye tarpon, skipjack, perch, estuary cod and small kingfish. The best form of fishing in the estuary is casting lures with light tackle from the drifting boat towards the mangroves or fly-fishing the same way. Some big fish are caught trolling lures in the main channels and also drifting in the main channels with live bait. 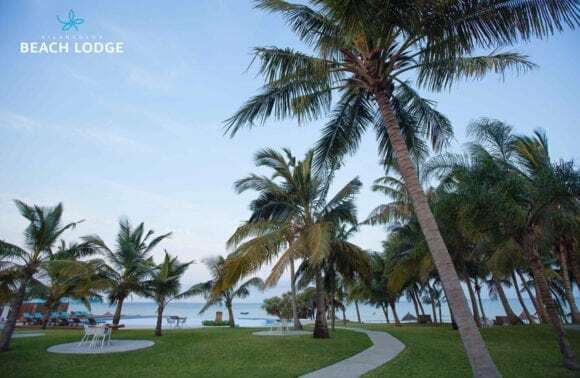 From the beaches of either the river mouth or the island anglers can expect such gamefish species such as kingfish, queenfish, king mackerel, springer and barracuda. For those who enjoy battling the heavies there are also sharks, sandsharks and rays. Other species that one can catch from the side are: Pompano, spotted grunter, bonefish, stumpnose, rockcod and various species of snapper. There are a variety of productive methods of fishing the surf, including: light tackle lure fishing, plug and spoon casting, fly fishing, bait fishing, live bait fishing and night fishing. 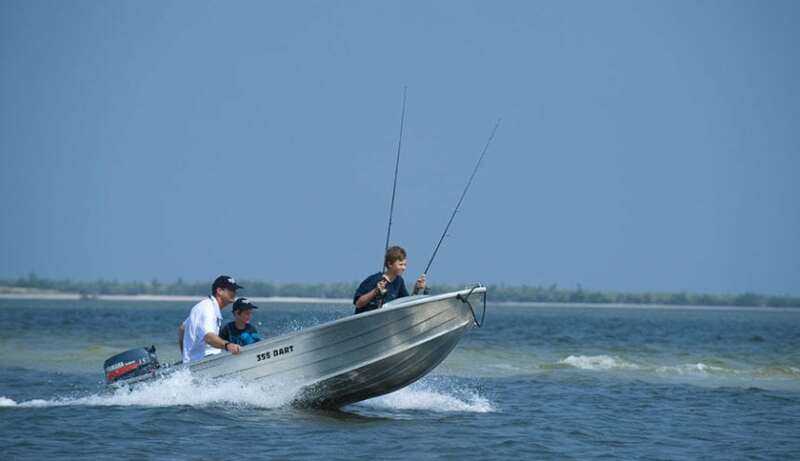 On a pushing or high tide one can cast baits, plugs, spoons or flies at the point or from the island. On an outgoing tide it is productive to swim a live bait or a dead bait out with a balloon using the current too get the bait out a long way. This method is good for catching big kingfish, king mackerel and sharks. There are no rocks in the deep water around the point, so kingfish cannot cut you off and chances are good of landing fish once they are hooked, even on light tackle. Night fishing is excellent with bait, live bait or casting weighted Rapala type lures. Mostly kingfish, sharks and rays are caught at night, but it is also a good time to catch stumpnose, bonefish and springer from the beach. 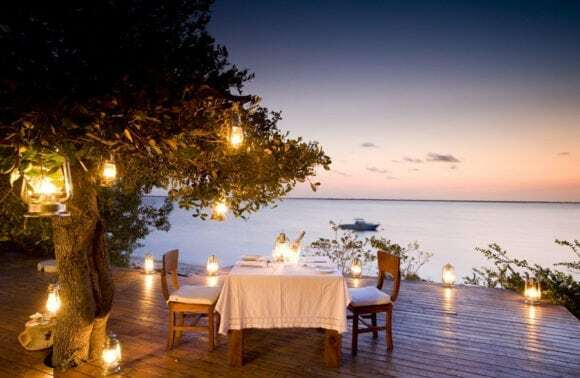 The lodge will arrange for a bonfire, and dinner to be served on the beach for those who wish to night fish and a fly camp with dinner, drinks and a fire can be set up on the island if guests would like to overnight there and fish through the night. Rio Azul offers some of the finest offshore fishing available in Mozambique. 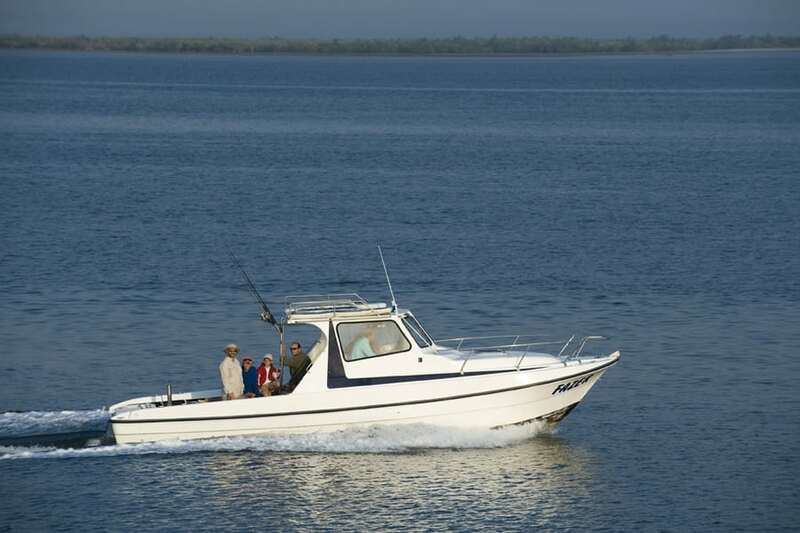 The lodge boats are skippered by experienced and qualified fishing guides, who know the area intimately. They use customised cats which are reliable, safe and comfortable to fish from. Launching from the estuary is safe, with no surf to negotiate. The boats have access to some exceptionally productive reefs that receive very little fishing pressure. 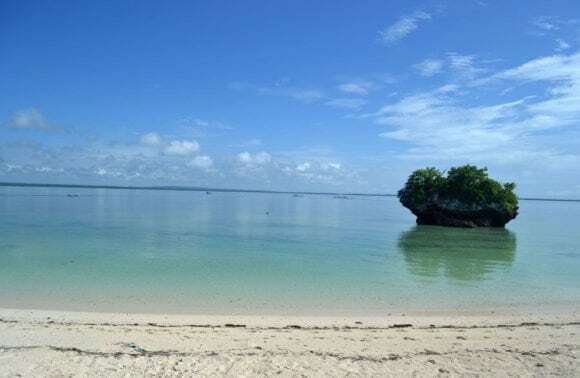 Guests have the choice of trolling, plugging, jigging, fly-fishing or drift bait fishing for the game fish that occur in the ocean off Bartholomew Diaz. All species of Indian Ocean game fish from kingfish to marlin are caught in the area. Boats fish two clients at a time. 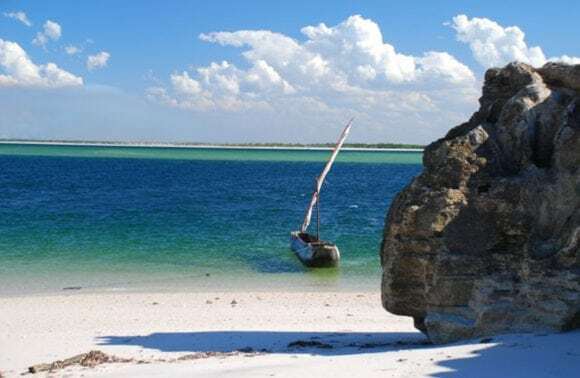 The nearest reefs are a ten-minute run from the lodge, and reefs right up to 25 mile reef north of Bazaruto Island are accessible to the lodge’s boats. Tackle for offshore fishing is available and its use is included in the cost of daily boat chartering. Spinning or baitcasting rod 6’6” to 7’ long. Matching reel loaded with 12 to 14 lb nylon or 20 to 30lb braid. Matching reel with nylon of at least 30lb or braid of 80lb. Good quality heavy duty snaps. Plugs with heavy duty split rings and extra strong hooks. Spare hooks and split rings for lures. Rod 7 or 8 weight. Matching reel with at least 100m backing. Matching reel with at least 200m backing. “It was very good. Transport to and from the airport was well done and the reception at the lodge excellent. The food was out of this world, I cannot compliment it highly enough. Staff were extremely pleasant and helpful and Reon and Michelle were excellent hosts. I enjoyed the fishing as mangrove fishing was something new to me and I managed some good catches. We went out to sea only on one day. My comment here as someone who fishes Mozambique every two months is that Reon lacks experience. I suggested trawling and we immediately started catching fish. Whilst doing this we discovered another hot spot and caught some nice fish jigging. He needs to get out more and explore the area for reefs and ask other fishermen for co-ordinates. I would return quite happily it’s a lovely place.